Nok Air is planning more rapid expansion in 2H2015 and 2016 as the Thailand-based LCC adds another eight aircraft. Nok’s fleet is expected to grow from 24 aircraft currently to 32 aircraft by the end of 2016, giving it ample capacity to grow in both the domestic and international markets. Nok will continue to pursue expansion domestically as it seeks to maintain its market leading position despite intensifying competition. But Nok is also making a major push in the regional international market with the launch of services to Singapore, three routes to Vietnam and expansion in Myanmar, which is currently Nok’s only scheduled international destination. Nok is now planning to expand its new Dash 8 Q400 turboprop fleet to at least eight aircraft, enabling it to expand on secondary domestic routes and launch new secondary international destinations such as Da Nang in Vietnam. Additional 737-800s will be used to continue expansion on domestic trunk routes as well as launch services to Hanoi, Ho Chi Minh, Singapore and several destinations in China. This is the second in a two-part series of reports on the network expansion plans of the Nok Group. The first part focused on expansion by Nok and NokScoot in China and Taiwan along with Nok’s plans for taking over NokScoot’s Bangkok-Singapore route. This part will focus on Nok’s plans for expansion in other Southeast Asian markets, in particular Vietnam, and continued expansion in the Thai domestic market. Nok Air currently has the largest domestic network in Thailand with 24 destinations. But Nok only operates scheduled services to one international destination, Yangon in Myanmar, which it launched in late 2013. Nok also currently operates regular charter flights to three destinations in China. Nok plans to expand its Chinese network to six destinations by the end of 2015 and convert flights to its three existing Chinese destinations to scheduled services. Nok Air CEO Update from CAPA on Vimeo. Nok has focused almost entirely on the domestic market since commencing operations in 2004 with the exception of a brief foray into international services in 2007, when it operated scheduled services to Bangalore in India and Hanoi in Vietnam. Nok has particularly pursued rapid domestic expansion over the last four years, more than tripling its domestic traffic since 2010. Nok carried 7.4 million domestic passengers in 2014 compared to only 2.2 million in 2010. In 2014 it carried only about 200,000 scheduled international passengers. In Jul-2015 Nok confirmed plans to launch its second scheduled international route, Bangkok-Ho Chi Minh, and began tickets sales. Nok will initially serve the Bangkok-Ho Chi Minh market with four weekly 737-800 frequencies from 1-Oct-2015, increasing to daily from 25-Oct-2015 and double daily from 1-Dec-2015. Over the last two years Nok has been planning to re-enter the Vietnam market but has repeatedly delayed the launch of Bangkok-Ho Chi Minh, waiting for the right market conditions. Nok is confident that now is the time to enter the Thailand-Vietnam market. Bangkok-Ho Chi Minh is a highly competitive market with seven daily flights from three LCCs, including three flights from Thai AirAsia, three flights from VietJet Air and one flight from Jetstar Pacific. There are also three full-service carriers currently competing on the Bangkok-Ho Chi Minh route including Thai Airways with 12 weekly widebody flights, Vietnam Airlines with 21 weekly A321 flights and India’s Jet Airways with seven weekly 737-900 flights, according to schedule data from OAG. Nok’s decision to quickly ramp up to two daily flights shows it is confident there is room in the Bangkok-Ho Chi Minh market for another player. Nok will account for about 23% of LCC capacity between Bangkok and Ho Chi Minh in Dec-2015 compared to about 33% for AirAsia, 33% for VietJet and 11% for Jetstar. Nok sees growing demand in the Thailand-Vietnam market, including growing outbound demand as Vietnam no longer requires visas for Thai citizens. Nok should be able to carry a significant share of the Thais who are now holidaying in Vietnam given its strong brand in Thailand, particularly among the Thai middle class. Over the last decade Nok has built up strong loyalty among Thailand’s new and young middle class population. The Nok Group is well positioned to grow internationally as this sector of the population starts to travel overseas more, in particular countries that now provide visa-free travel to Thais such as Japan, Myanmar, Singapore and Vietnam. Nok has a relatively unfamiliar brand in Vietnam, making it challenging to compete with more established LCC brands in the Vietnamese market. Thailand has seen a surge in Vietnamese visitor numbers, including a 35% increase in May-2015 to 70,000. In the same month Vietnam recorded only 14,000 visitors from Thailand. Nok is also planning to resume services within the next few months to Hanoi and launch services to Vietnam’s third largest city, Da Nang, although it has not yet set a launch date or begin sales for either of these planned new routes. Hanoi is expected to be served daily with 737-800s, which Nok operates in 189-seat single-class configuration. Nok CEO Patee Sarasin told CAPA on the sidelines of the 5-Aug-2015 CAPA Australia Pacific Aviation Summit that Bangkok-Da Nang will be launched as a less than daily service using 86-seat Bombardier Dash 8 Q400 turboprops. Bangkok-Hanoi is also a highly competitive market that is already served by three LCCs. Thai AirAsia, VietJet Air and Jetstar Pacific each have one daily flight on Bangkok-Hanoi while Thai Airways and Vietnam Airlines each currently operate two daily flights, according to OAG data. Qatar Airways also operates a daily Bangkok-Hanoi sector as part of a flight that originates in Doha. The Bangkok-Da Nang route has not been served non-stop by any carrier since now defunct Thai regional carrier PB Air pulled out in 2009. But the Da Nang market has been growing rapidly in recent years, attracting service from Malaysia AirAsia and several North Asian carriers. Jetstar Asia also announced on 4-Aug-2015 plans to launch on 27-Nov-2015 four weekly flights from Singapore to Da Nang, a route which is already served by Singapore Airlines full-service regional carrier SilkAir. Overall LCCs currently account for about 40% of seat capacity between Thailand and Vietnam, including 16% for AirAsia, 16% for Vietjet and 8% Jetstar. Once it launches services to all three of Vietnam’s main cities Nok will likely account for more than a 10% share of seat capacity between the two countries, driving up the overall LCC penetration rate to nearly 50%. Da Nang is in line to become Nok’s first international route served with its new fleet of Q400s. But Nok is also now looking at potentially using its expanding turboprop fleet to operate regional routes to Myanmar including Mae Sot-Yangon, Chiang Mai-Yangon and Bangkok-Mandalay. Nok is keen to expand in Myanmar as it has quickly and successfully established a presence in the Myanmar market since the launch of Bangkok-Yangon services in late 2013. Nok recently unveiled plans to increase capacity on Bangkok-Yangon from 14 to 18 weekly 737-800 flights weekly effective 1-Sep-2015. Thai AirAsia is currently the largest LCC in the Bangkok-Yangon market with between two and four daily flights depending on the season. The withdrawal of Golden Myanmar in 1H2015 left AirAsia and Nok as the only LCCs in the large and rapidly growing Bangkok-Yangon market. Thai AirAsia is also currently the only LCC in the Bangkok-Mandalay market. Nok expects outbound demand from Thailand to continue growing rapidly as Myanmar recently introduced a visa waiver policy for Thais entering Myanmar by air. Nok is now the smallest of the Thai carriers serving the Myanmar market – not surprising as it was the last to enter the market – and is keen to narrow the gap with its peers, particularly LCC rival Thai AirAsia. Nok is also aiming to build up its brand in Myanmar through a new partnership with Myanmar Airways International (MAI). Mr Patee said Nok plans to soon implement a one-way codeshare with MAI selling Nok-operated flights. MAI's two daily flights between Bangkok and Yangon are not expected to be part of the new codeshare. MAI carried 130,000 passengers to and from Bangkok in 2014, making Bangkok its largest destination but smaller than any of the four Thai carriers serving the Bangkok-Yangon market. Nok will likely continue to add capacity on the core Bangkok-Yangon route. Expansion of Nok’s Myanmar network using turboprops to cover secondary routes would be logical as Nok previously linked Mae Sot in northwest Thailand with two destinations in Myanmar, Yangon and Mawlamyine, using smaller Saab 340 turboprops operated by SGA Airlines under the Nok Mini brand. Nok could potentially resume service from Mae Sot to Yangon using Dash 8s or ATR 72s and also use turboprops to launch service to Yangon from Chiang Mai. Mae Sot-Yangon is currently not served by any carrier while Bangkok Airways, Golden Myanmar and Air Bagan currently serve the Chiang Mai-Yangon route – all with ATR 72s. The Nok Mini operation was suspended in Mar-2014 as Nok ended its relationship with SGA. As CAPA previously outlined, Nok has since been focusing on expanding its regional operation using its own turboprop fleet. Nok has taken over eight of the 13 routes which SGA previously operated. Nok has operated a fleet of two 66-seat ATR 72s for several years and the group initially decided to become the launch customer of the new high density 86-seat version of the Q400s in late 2013. Nok currently operates four Q400s, all of which were delivered in 2014. Nok initially placed an order for only two Q400s plus two options. But it quickly exercised the two options and committed to two more aircraft for a total of six. Mr Patee said the fifth aircraft is slated to be delivered by the end of Aug-2015 while the sixth aircraft is expected to be delivered in Nov-2015. Mr Patee told CAPA Nok is now also in the process of committing to a further two Q400s which will be sourced via operating leases and delivered in 2016. Nok eventually plans to phase out its ATR 72 fleet but the carrier is contracted to leasing its two ATR 72-500s until 2017. Additional Q400s could therefore be acquired in 2017 to replace the ATR 72s. Expanding the turboprop fleet from six aircraft currently to 10 aircraft will enable Nok to expand its domestic regional operation as well as launch regional international routes starting with Bangkok-Da Nang. Nok sees growing demand on some of its smaller regional routes such as Bangkok-Chumphon. Nok serves several smaller airports in Thailand which cannot accommodate 737s or A320s. This gives Nok a competitive advantage on regional routes as its two main competitors, Thai AirAsia and Thai Lion, only operate jets. Nok also continues to use turboprops on some routes that are also now served by Thai AirAsia, which has added several smaller domestic destinations over the past year using A320s. Nok has expanded in most of the smaller markets that AirAsia has launched by adding frequencies. Nok now uses a mix of different aircraft in most of these markets, enabling it to offer more flights overall and better match capacity with demand. Thai Lion Air is also expected to start serving some smaller destinations as it is now serving all major domestic trunk routes. Thai Lion’s launch of services in Jun-2015 to Ubon Ratchathani gives Thai Lion a presence on the eight largest domestic routes from Bangkok Don Mueang. Thai Lion has quickly expanded on most of these routes, giving it in some cases more capacity in these markets than Thai AirAsia and Nok Air. Nok has been impacted by Thai Lion’s rapid domestic expansion since the carrier launched at the end of 2013, as yields in the domestic Thai market have dropped significantly. Nok incurred a net loss of THB666 million (USD21 million) in 2014 compared to a profit of THB1.066 billion (USD35 million) in 2013. Mr Patee told CAPA TV that Nok expects only a small profit – “if any at all” – for 2015 as competition has remained intense. But Nok is optimistic that the worst is behind it as yields have started to improve somewhat in recent months. Nok generated a net profit of only THB56 million (USD1.7 million) in 1Q2015. Nok is expected to soon report another small profit for 2Q2015. Nok will continue to add capacity in the Thai domestic market as it expands its fleet in 2H2015 and 2016. Along with the four additional Q400 turboprops, Nok plans to take two more 737-800s by the end of 2015 and another two in 2016, giving it a fleet of 22 jets by the end of 2016 along with 10 turboprops. Nok currently has 15 737s commitments, including seven 737-800s and eight 737 MAX 8s, according to the CAPA Fleet Database. While a large chunk of the capacity from the additional 737s will be allocated to new international routes, Nok will also be able to continue adding domestic flights using 737s. The additional Q400s will be allocated almost entirely to the domestic operation. Over 95% of Nok Air’s capacity is now allocated to the domestic market. Mr Patee told CAPA TV that Nok’s main focus will still be the domestic market as Nok is keen to maintain its leading domestic position despite the lingering overcapacity concerns. Nok has already accelerated domestic expansion since the Dec-2013 launch of Thai Lion Air. The outlook for Nok remains relatively challenging as intense competition and overcapacity in the domestic market is unlikely to ease anytime soon. Thai Lion continues to expand rapidly and Thai AirAsia also continues to add domestic capacity. Meanwhile Nok’s international operation will likely incur losses as it will take time for all the new routes to mature. But strategically the group needs to expand in the international market using both its short-haul carrier and its new medium/long-haul joint venture carrier. There will be obstacles to overcome as Nok slowly builds its brand overseas and faces stiff competition in virtually every new international market it enters. 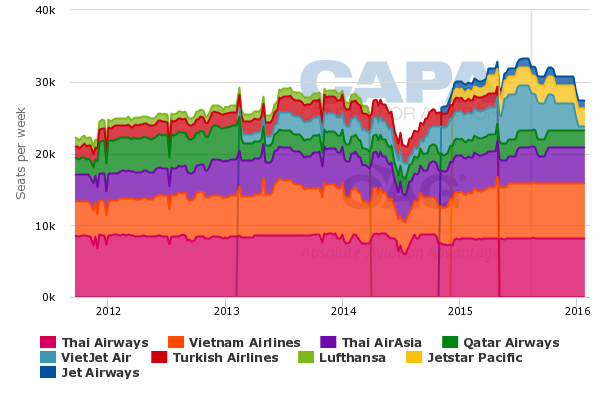 But the 11-year old carrier needs to start expanding from its strong domestic roots, particularly as its part-owner Thai Airways has been restructuring and will be unable to meet the fast growing demand at the bottom end of Thailand’s international market.